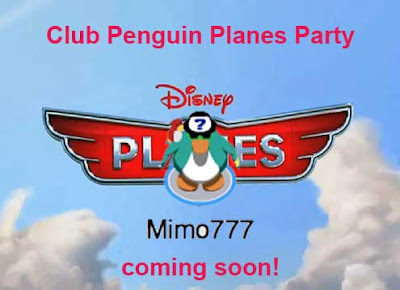 Club Penguin Cheats by Mimo777 Club Penguin Cheats by Mimo777: Club Penguin Planes Takeover Party! Let's face it, Club Penguin will soon (most likely next month) have a Disney's Planes Takeover Party! I can see it now... we will be flying over the Community Garden and crop dusting it. Haha! But what I want to know, is if we can fly the Millennium Falcon, Planes, and even as Super Heroes, why can't we get to Rockhopper Island? Speaking of Rockhopper, when do you think we will ever see him again? Do you think this will be the next party? Let me know what you think about the next "Takeover!" They better not replace the Christmas Party with a Disney Takeover: Frozen party. I'll be mad. that or a teen beach movie party as Disney is always using club penguin to promote its movies. The next party is teen beach movie takeover not disney planes takeover! we are having WAY too many takeovers! I want to watch this film but I'd hate it to be destroyed by club penguin. I'm honestly in the mood of quitting club Disney so I can avoid the frozen party. I might stay for the pirates of the carribean party, what am I saying? Cp will literally crush the movie which is why I'm gonna stick to Disney infinity, my only hope in Disney games. They probably might, knowing the idiots at Disney. I really hated how they replaced the St. Patricks Day and the Holiday Party! ~As for the Disney Planes Takeover, i think they will. It's just THAT dumb to make into a takeover party. They're even doing a Surfs Up Takeover, which really bugs me. Might as well just recreate Club Penguin into Club Disney ._. Club Penguin said they knew their mistakes this year and make less takeovers next year and they also said the Summer Jam Teen Beach Movie would be the last takeover of the year, thankfully the Fair and the Christmas parties are not getting replaced. hey bro i have a code for you ! You will get Mask of Justice and 500 coins! They won't. Spike Hike said that were only having 4 Takeovers this year. OMG I can't believe this site is still working. I remember visiting it 5-7 years ago.But I think it had a lot more comments back then..
Hope not. Disney needs to understand that CP is a game where you can waddle around and meet new friends, not an object being used to advertise everything new that happens on Disney. When will they have a non takeover party hmmm?? IT IS SO ANNOYING! NO MORE STUPID TAKEOVER PARTIES!!! I prefer christmas, fair, halloween, medieval, music jam (normal), adventure, april fools, puffle, penguin awards and card jitsu parites only. So during January and June they can put their own takeover or different parties during these months.